Boyfriend also does the shopping, being much more budget-conscious than I am. And budget-conscious Boyfriend is a little sick of me saying, “hmm, this is interesting! I bet I can make something out of that!” and then, you know, not. It’s a First World Problem, I know, but I’m constantly throwing out fruits and vegetables before I decide what to do with them. So I have agreed to do some lightweight menu-planning. 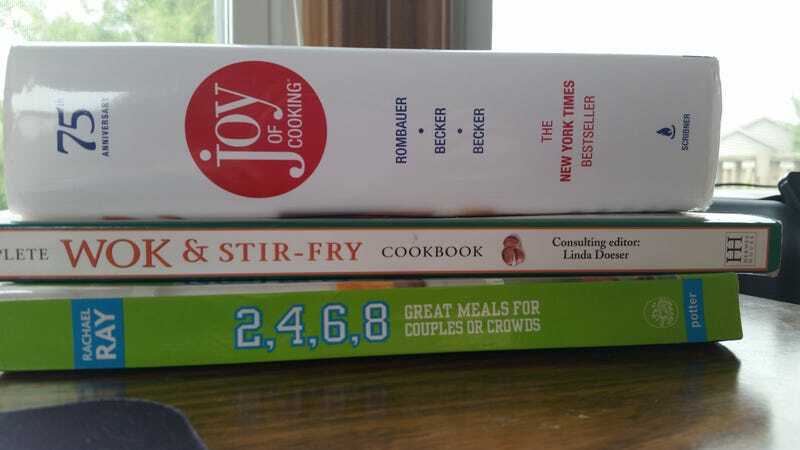 For this week, I have decided *not* to use the cookbooks you see above (not pictured: my actual favorite, Michael Ruhlman’s Ratio) and am instead planning a menu based on the things I know how to make consistently without screwing up. “Hamburger Mushroom-ay on Potato” (don’t ask, just remember I’m Midwestern and was once a six-year-old girl with a divorced dad). Needs ground meat, cream of mushroom soup, onions, various spices, potatoes, milk, butter. Broke Girl’s Pad Thai (ramen, drained; sesame oil, soy sauce, crunchy peanut butter, canned chicken, frozen mixed veggies, minced garlic, powdered garlic, chili powder, and eggs. Or approximations thereof). Broke Man’s Tuna Casserole (noodles of some sort, cream of mushroom soup, canned tuna, mozzarella, various spices). Mac & Cheese & Bacon (preferably with a nice cold root beer). Pasta Whatever (some kind of pasta, ground sausage, red sauce of some kind, pasta-y vegetables, spices, cheese, olive oil, butter) I have very strong feelings about the sausage and am indifferent to everything else. Stir-fry (chicken breast, broccoli, bell peppers, onions, ginger, garlic, chili powder, sesame oil, soy sauce, rice). Roast Duck (duck, olive oil, rosemary, pepper, sea salt, rice & things that can be stuffed inside the duck, roasted brussels sprout). Not an actual stand-by, but a regular when I forget that budgets are important and I feel like spending $10/person on dinner. Bagels & Salmon & Cream Cheese & Capers (not sure if Boyfriend will like). So, I think the thing to do is not buy all of this in one week, right? Boyfriend has just voted for Hamburger Mushroom-ay, Tuna Casserole, and Green Bean and Strawberry Salad, bagels & cream cheese. Plus “Salad, I guess.” So, um, does anybody know how to make a really big salad that I can make on a Sunday and won’t go bad before Saturday? Maybe I’ll just buy, like, whatever at the grocery store? Oh. Right. Change! It is hard.